This month, theATHENAproject is continuing its growth around the globe. On January 15th at the Yokosuka Naval Base Galley, Athena Far East is kicking off their inaugural event. I am especially excited to see the ideas presented at ATHENA Far East – I’ll tell you why in just a bit. Athena Far East is this Friday! We all know that innovation is fundamentally the process of inventing, introducing, and adopting a new product, practice, system, or behavior. The ability to innovate is impacted by a myriad of factors, some of which are controllable while others are non-controllable. Some people work in an environment that suppresses change or devalues employees who are young and inexperienced. Some people fear failure, think they are not creative enough, or are afraid of speaking publicly. I’ve been a part of ATHENA since its inception and what an amazing journey it has been. When provided the opportunity to use their VOICE, Sailors are an unstoppable force. An interesting trend I saw in San Diego: The ideas pitched by Sailors were often tied to their parent command’s life cycle. For instance, Sailors who recently returned from deployment expressed ideas more tactical in nature, while those in the shipyard generally had ideas on improving maintenance, and those in the training cycle were focused on streamlining admin and qualifications. A little throwback picture: The first ever pitch, when Athena was still unfortuntely named WikiWardroom. 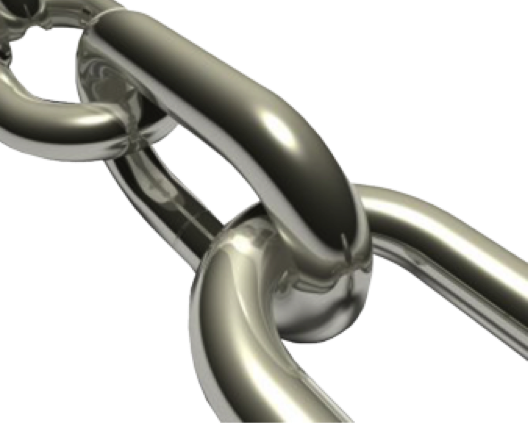 Streamlining admin allows for more training time. But as I look into my ATHENA Far East crystal ball, I see FDNF Sailors pitching ideas that leverage current technologies to find new ways to execute the mission and conceptualizing new weapons systems. As ATHENA has continued to grow, we’ve made a constant effort to innovate our own process, trying out new things and gaining feedback to try and make ATHENA better. In our recent events, we’ve experimented with “Shark Tank-style” panels of leaders to provide concept feedback, awarding personal development experiences to our participants and winners, inviting Sailors who have made headway with their projects as keynote speakers and beyond. In that spirit, we’re prototyping a new experience for our first Far East event! 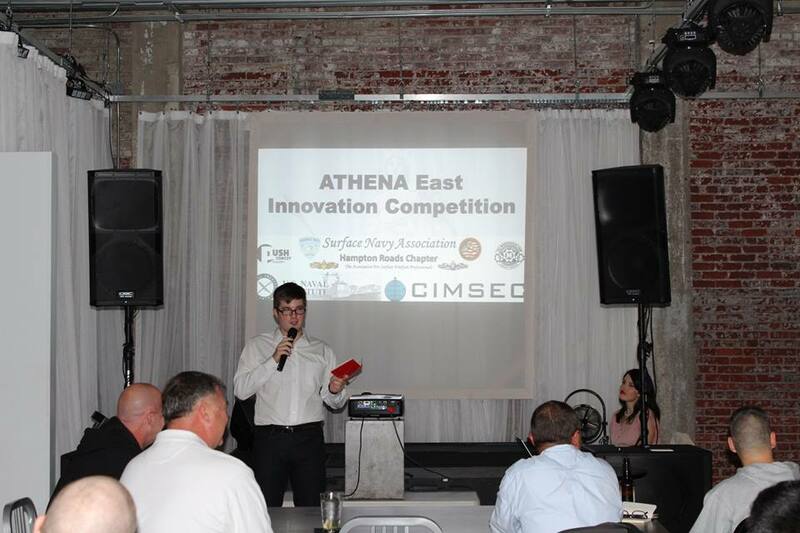 Specifically unique to ATHENA Far East is our partnership with the Defense Entrepreneurship Forum (DEF) as an official Agora and our endorsement by and involvement with the Military Writer’s Guild, and SECNAV’s Naval Innovation Advisory Council. Brett Vaughn, one of the “Sharks” at Athena East 2.0, getting down to business with a presenter as CAPT Carter and CAPT Bodvake look on. Expanding to Japan is incredibly exciting for not only ATHENA, but the Naval “Innovation Insurgency” as a whole. But beyond that, I think that it’s important to provide a stage for the bright minds currently serving in this Theater to have their voices heard. We hope that you’re as excited about it as we are. Come see what ATHENA is all about, and join us in making positive change in the Navy! We hope to see you there! There are loads of Athena Events coming up! If you’re in the San Diego, Groton or Patuxent River areas, connect with us if you want to be a part of our upcoming events! Connect with us on Facebook: www.facebook.com/athenanavy or follow us on Twitter: @AthenaNavy. Interested in starting a movement of your own? Message us, or e-mail athenanavy@gmail.com! Weather be damned! 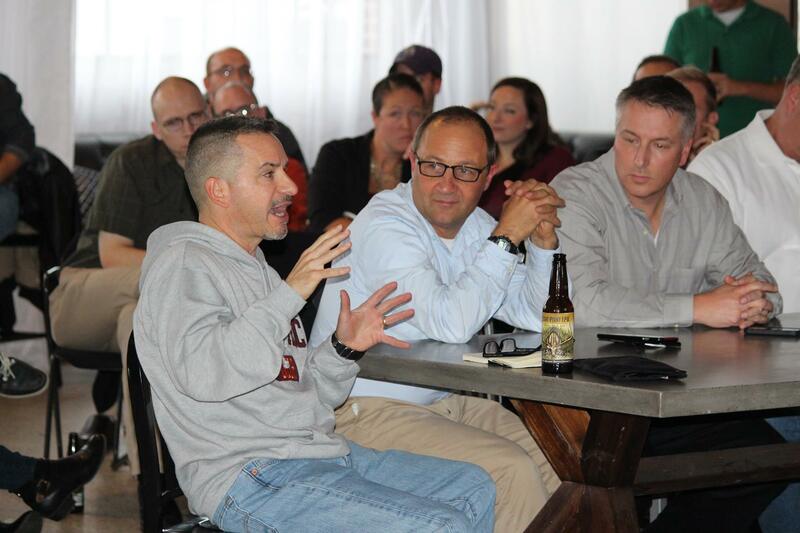 Despite the rain spinning off Hurricane Joaquin, a horde of innovators gathered at Work|Release on Friday in Norfolk, Virginia for the second Athena East event. 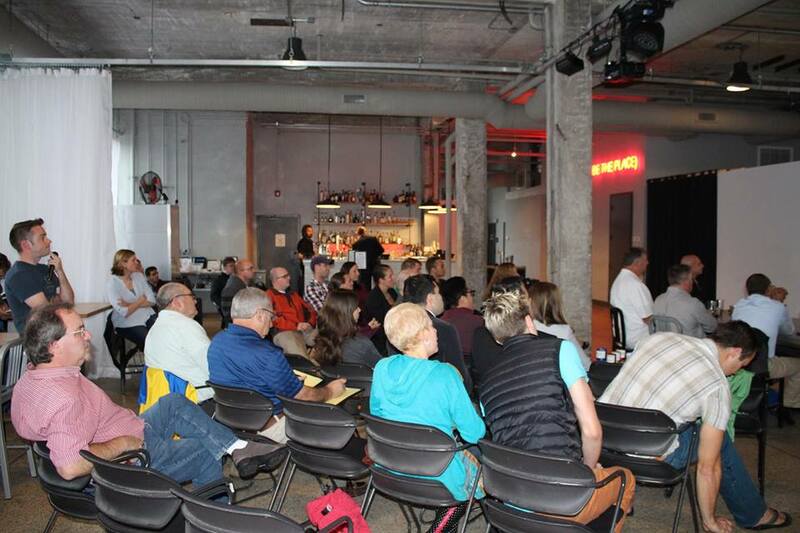 The crowd of like-minded innovators that braved the elements to come out to Athena East 2.0! 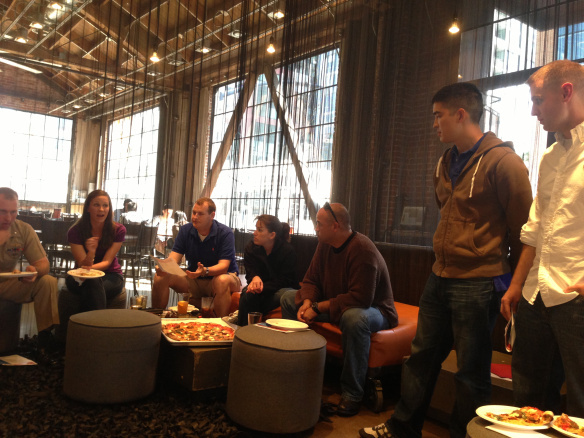 We love to iterate our process, so we had quite a few “firsts” for this event. This time, our event was co-sponsored by the Surface Navy Association, the Center for International Maritime Security (CIMSEC), and the United States Naval Institute. We were also happy to have our friends from the Virginian Pilot there, writing a great story about the event you can read here. Adding to our firsts, we had a panel of senior “Sharks” to provide some insight on our five presentations and help to find pathways for those concepts to find a way to the Sailors that could benefit from them. While these Sharks didn’t cast votes (as always, that was the responsibility of the 60 innovators who braved the elements to come out) they did provide feedback to each of the presenters to contribute to our “Yes, And” culture. Our Cyber Shark, CAPT Heritage showing off his custom Captain hoodie. The Sharks included CAPT Robert Bodvake, Commodore of Destroyer Squadron 22; CAPT John Carter, Commanding Officer of USS BATAAN (LHD 5); CAPT Sean Heritage, Commanding Officer of Navy Cyber Defense Operations Command; CAPT Jeffrey Sheets, Production Officer for the Mid Atlantic Regional Maintenance Center C-900; and Brett Vaughn, Science and Technology Advisor to OPNAV N2/N6. The tremendous insight that these Sharks provided by donning their raincoats (and in some cases, hoodies) to catalyze the creativity at the event was phenomenal and absolutely something that The Athena Project will be leveraging in our future events! One of our sharks, Brett Vaughn, getting down to business with a presenter as CAPT Carter and CAPT Bodvake look on. Another addition we’ve made to our process – and one that’s definitely going to stick – is the prizes we gave to our participants, donated from local organizations. While we gave a prize to the winner at Waterfront Athena Eight (or, Athena West 8.0) provided by our friends at MakerPlace in San Diego, this time we gave amazing prizes to all of our presenters. All our participants received memberships to 757 Makerspace in Norfolk and Improv 101 classes provided by Push Comedy Theater, generously bestowed by our friends Beau Turner and Brad McMurren, respective heads of those fine organizations. At The Athena Project, we believe that unlike a simple monetary incentive, these prizes are tremendous for our Athenians’ personal development, and will go a long way to turbocharge their innovative spirit and give them tools they can bring back to their respective commands to make them better! With appropriate libations in the hands of our soggy audience, the innovation was set to get underway! Let’s get down to the ideas! Those who have had the joy of standing watch in the Combat Information Center of a surface ship may note that the headsets for the consoles in the space can leave a little to be desired. Some of the chief complaints of the existing headsets include durability, functionality, comfort and the fact that they are germ sponges, potentially passing illnesses from watchstander to watchstander that eventually spread throughout the small crew of a surface ship. What FC2 Vickers proposed was an elegantly designed adaptor that would allow Sailors to bring their own gaming headsets (or even iPhone earbuds) to watch, improving all the areas that had previously been Sailor gripes. Fielding questions from the audience on concerns such as preventative maintenance requirements and durability of commercial headsets, Vickers proposed since each individual would invest in their own headset, they would be much more likely to care for the equipment. And, to respond to durability concerns, Vickers referenced the likelihood of online video game players to throw their headsets across the room or through a TV when things didn’t go right. In nearly every instance, the gamer can just put the headset back on and continue playing. By comparison, Vickers said, if a shipboard headset is merely dropped there is a legitimate fear that the device will cease to function altogether. As the winner of Athena East 2.0, Vickers received a year-long membership to 757 Makerspace where he can continue to iterate his concept, which received high praise from the Sharks and from the crowd. Yet another Athena concept born out of frustration and wasted manhours, Warrant Officer Sturm proposed a fresh water system for amphibious ships to rinse off Marine Corps gear and expeditionary equipment upon return from the beach. In his daily job, Sturm wastes significant time and resources to reconfigure vehicles and scrub biologics off of them to prevent corrosion. He said that a fresh water washing system on the ramp of an amphibous ship that would spray vehicles down upon arrival would save the Navy considerable time and reduce potential safety mishaps, all while saving money for the Navy and Marine Corps by preventing corrosion of equipment. With a video demonstrating the operability of Sturm’s proposed system, the Sharks and the crowd were able to get a full feel of what his innovation would bring to the table (or the well deck, as it were). 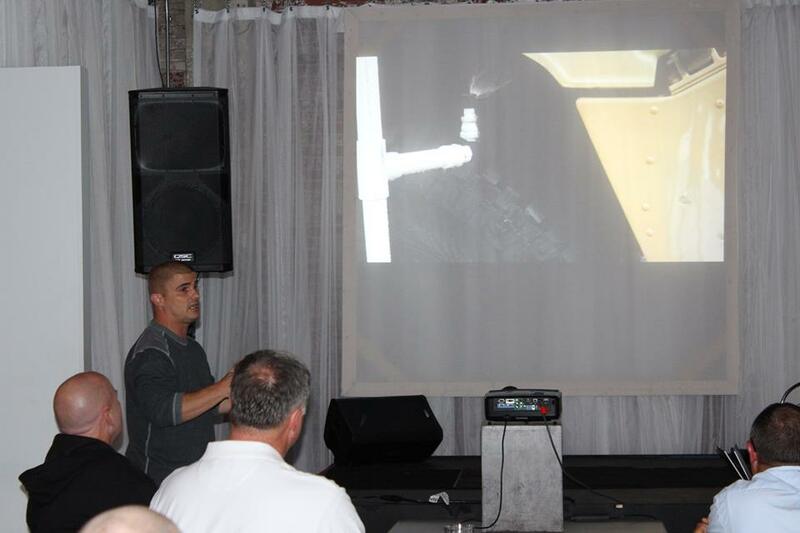 Pictures and video demonstrate the concept from CWO2 Sturm’s pitch. The inspiration behind Williams’ idea was the leadership training program for Chief Petty Officer Selects, and those striving to become Chief Petty Officers within the Navy called CPO 365. He noted that there was a gap in coverage for a program like this: Second Class Petty Officers, striving to become Leading Petty Officers at their respective commands did not have an open forum/panel-led discussion of important topics to prepare them for their next leadership position. Williams proposed constructing a program that would inspire discussion rather than “killing” attendees via Powerpoint and allowing Petty Officers to present peer-voted topics of importance. The idea inspired a generative discussion from the crowd, with Sharks requesting specifics (and eventually being introduced as the presenter’s Commodore), and a discussion about measuring the effectiveness of the program. Williams will continue to iterate his concept with the help of those in attendance, but his inspiring idea has identified a space in which a positive impact can be made for the future leaders of the Fleet. Obviously, a subject that’s at the very core of what we do at The Athena Project! LT Barkley pitched an concept that he developed over the last two summers to automatically write flight schedules for flight training squadrons like those down in Pensacola. Through testing and iteration, Barkley has used the program to execute over 7,500 flight events to cut down scheduling work time by 75% and producing a better scheduling product than 12 Junior Officers would spend a day working on. And it does the calculations in about a minute at the press of a button. Barkley did a live demonstration of his concept, which takes into account several metrics when generating the schedules. The crowd responded incredibly positively to the concept, and offered that the idea could be further developed to work within the Surface Community with the addition of more metrics and data, required to effectively build a watchbill on a Surface Ship. The Sharks liked it too, so much to make connections within the Office of Naval Research to continue development of the idea. Coursey’s vision is to put portable lathes, sintering machines and various other “making” tools closer to the Fleet to enable real-time creativity. He proposed that his goal of democratizing innovation could be realized by providing tools for Sailors with big ideas to make them happen, complete with policy recommendations. Coursey engaged with the Sharks, proposing that innovation must be something that we really do, specifically referencing the ability for Sailors to produce circuit cards on demand for repairs onboard ships. With all the ideas having been presented, we were fortunate to welcome two success stories of Fleet innovation while the votes were being tallied. AT1 Richard Walsh, a member of the CNO’s Rapid Innovation Cell, discussed the seven-year journey to bring his tool, SMART, to life. The tool helps to improve preventative and corrective maintenance by calculating probabilities to assist with replacement part ordering and real-time work scheduling. Following him, LT Jason Shaw discussed his path to patenting systems that he has developed to increase tool accountability during repairs. LT Matt Hipple emceeing his heart out. 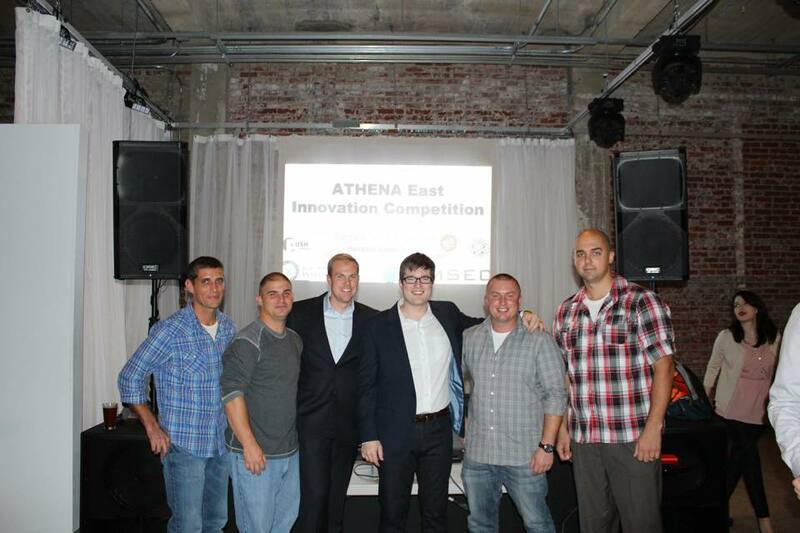 The power behind any Athena event is the network, and that was demonstrated in spades during Athena East 2.0. In many respects, The Athena Project is a Bat Signal: A way to “light up the sky” (that may or may not be filled with raindrops) to connect innovators and creatives within the DoD to work together toward making positive change for the future of our armed forces. 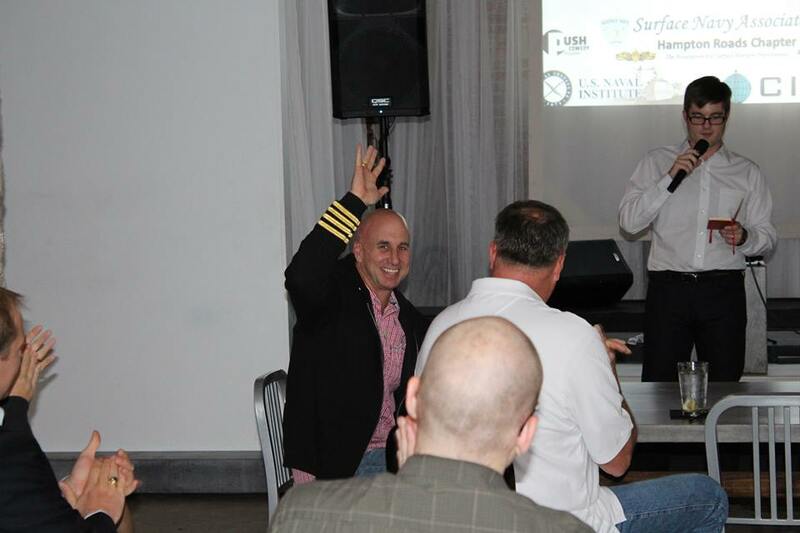 As we shine our signal into the air for our next events, whether it’s in Jacksonville, Yokosuka, San Diego, Hawaii, or Groton, we hope that we can band together to be the Innovation Initiative that the DoD deserves, and the one that it wants! Dave Nobles is a member of the Design Thinking Corps at Johns Hopkins University Applied Physics Laboratory and the founder of The Athena Project. He is also a Navy Reservist with the Office of Naval Research. 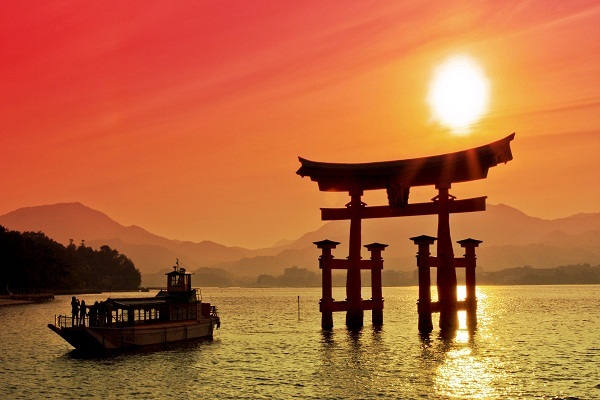 Stay tuned for the upcoming Athena Far East 1.0 and Athena Southeast 1.0! If you’re in the Jacksonville or Yokosuka areas and you have an idea you want to present, Message us! 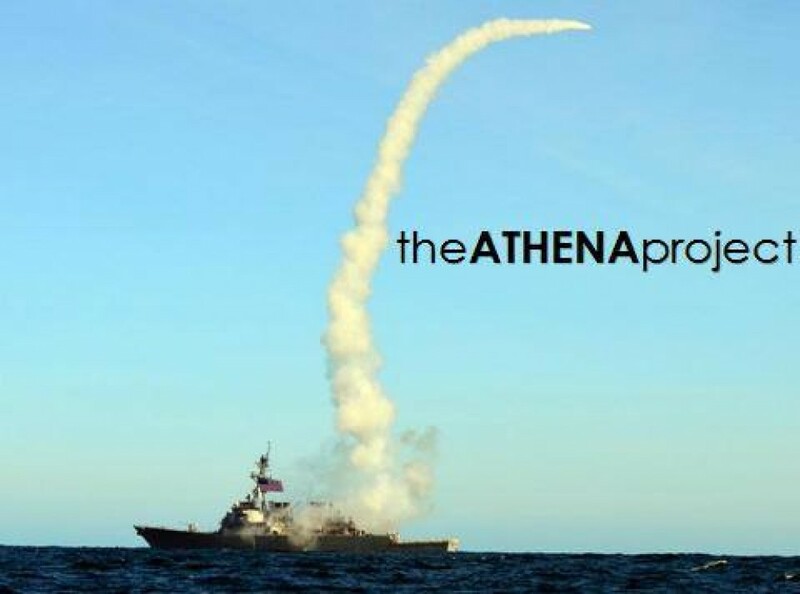 Connect with The Athena Project on Facebook: www.facebook.com/athenanavy or follow us on Twitter: @AthenaNavy. Interested in starting a movement of your own? Message us, or e-mail athenanavy@gmail.com! The most effective incubators tie burgeoning entrepreneurs with great mentors and guides to help them develop their business concepts, expand their network, and provide encouragement. Fortunately, the military has a number of senior level leaders who are very supportive of Service Members who are willing to take risks to improve the service they love. We feel that if someone has the intellectual courage to develop an idea, polish a pitch, stand in the scrutiny of peers, superiors, junior personnel, as well as community members, and then continue to champion an idea then they deserve the opportunity to connect with someone who could serve as a mentor and an accelerator for the development of their idea. And that, in essence, is what athenaLINK is all about! But, we need your help. We’re looking for senior leaders in the military, government organizations and laboratories, University Affiliated Research Centers, industry and beyond. We need leaders who have experience in the field to help our junior presenters refine their big ideas as they work to find paths to turn the concepts into reality! An incubative sponsor could be thought of as an egg warmer – helping keep an idea hot until it hatches. Or, since we occasionally quip that ATHENA is like Shark Tank meets TED Talks, the perfect leader to be involved would essentially be one of the Sharks in the Shark Tank – one of the seasoned leaders who can navigate the murky waters of military bureaucracy, avoid the shoals, achieve results and who is hungry to sink their teeth into an idea that will pay dividends for the military. 3-6 months service as an active coach, guide, advisor, and encouraging supporter to help get the idea off the ground. Focused instruction and assistance in developing a personal network to advance the idea. Probing questions and intentional critical thinking aimed at resolving obstacles and potential conflicts. A personal commitment to help the willing achieve measurable results. Continue in the pursuit of implanting their idea with their greatest effort, seeking measurable improvements. Take the initiative in communicating with their sponsor on a regular basis. Accept feedback and criticism with an open mind and willingness to challenge their own assumptions. Now to make the connections happen. 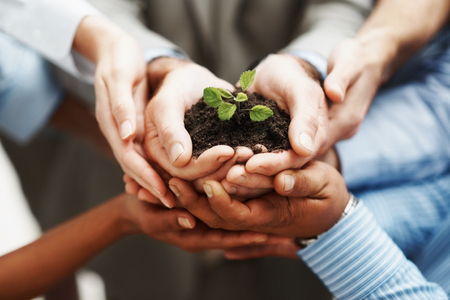 Whether as a seasoned leader and agent of positive change you consider yourself a sponsor, egg-warmer, or shark, take a look at the list of ideas in the concept catalog and see if one matches an area of interest for you and consider sponsoring that person. Email us here: athenanavy@gmail.com and we will connect you! If you are an idea champion and are looking for an incubative sponsor, feel free to reach back to us or reach out to someone you would like to connect with and give them a little explanation of what this program is about, share the points of agreement mentioned above, and ask them to join you in making a positive difference. Lastly keep us informed of your progress so we can share it with everyone to inspire others to step out in courage. Finally, as we roll out this new program here is a quick refresher on a couple of our other programs. athenaTHINK: Learn methods of design thinking, systems thinking, creativity and more generally critical thinking through a workshop aimed at conjuring new ideas and approaches to pertinent problems and strategies. 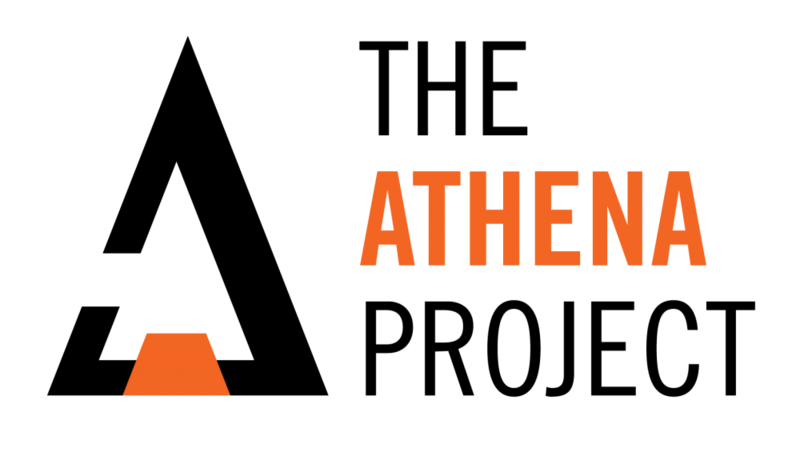 athenaSPEARs: Bring the network together to solve a specific problem, leveraging talent in a hack-a-thon environment and exercising skills developed through athenaTHINK. Of course, if you’re interested in getting involved in either of those initiatives, don’t hesitate to shoot us a note! athenaLINK is a great opportunity to get involved with the ATHENA Network and we’d love to hear from you! We’re excited for the future of ATHENA and hope you join us as we grow the wave of creativity in the fleet! LCDR Drew Barker is an E-6B pilot returning to the TACAMO community as a member of the VQ-4 Shadows. Get involved with Athena in San Diego at Societe Brewing Company on August 28th and in the Norfolk area this fall! Stay tuned for more grassroots projects! 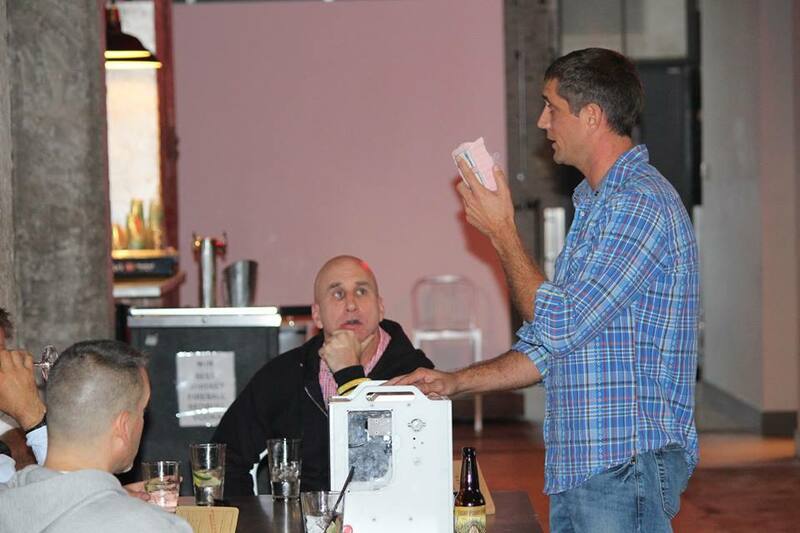 Have questions or interest in hosting an event? Connect with us on Facebook: http://www.facebook.com/athenanavy, follow us on Twitter: @AthenaNavy, or e-mail us at athenanavy@gmail.com!